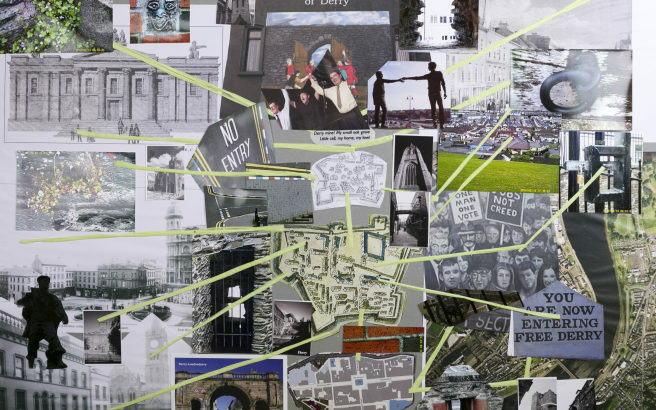 In our work with Ulster University on Connecting Commemorative Communities we have been using a methodology based on collective mapmaking as a means of helping workshop participants to draw out and communicate their thoughts on commemorative landscapes. Mapmaking can and does pretend to be an objective science in which landforms are carefully measured and represented to scale via symbols, lines and colours on paper. However, maps never merely record topographical knowledge. They also shape it. D’Fishing Hands o’ Fair Isle project created a map visualising local knowledge of good fishing grounds . A ‘fishing hand’ is a phrase indicating the alignment of two sets of landmarks . They have been used for centuries by local fishermen. This is clear when we consider what is included in a map, and what is not, and how what is included is represented. The first maps made by Europeans of Australia depicted it as a blank space, negating Aboriginal communities’ presence in, and use of, the landscape. Those blank maps empowered Europeans to behave as though Aborigines were of no account. Historically, accurate and detailed maps also facilitated invasion and colonisation. The plantation of Ulster depended on maps showing land use, resources and boundaries, and was disrupted because of serious inaccuracies in early maps. Artist Julie Mehretu describes her canvases as ‘story maps of no location’. She overlays different architectural features and geographical elements of a city from many different viewpoints, creating chaotic images that relate more to the viewers imagination than any definable reality. This is not to say that maps are not useful or truthful, but merely that they must always be interpreted. Multiple maps offer multiple perspectives on any given place, thereby building a better understanding of the complexity of place and people’s uses and imaginings of it. With this in mind, we have been asking project participants to make collective maps. Using their own photographs, as well as images drawn from archives, newspapers and postcards, participants have incorporated personal and emotional responses to the landscapes in question. Street artist Eoin McGinn created a mural for the Culture Night Belfast Almanac 2015 in response to ideas discussed relating to the city environment. The CNB Alamanac is a new approach in public consultation, gathering a creative guide for decision makers and disseminating the outputs via performances and associated digital content. The maps are critical, of both landscape and image. They are not about consensus – diverse and even conflicting viewpoints can co-exist on the same map. It is our hope that the mapmaking process, and the maps themselves, point creatively and thoughtfully to the intertwining of geography and history.